A sugar-free, Healthy and Sweet Life is absolutely 100% possible! I was looking for years for a natural sweetener with zero calories and zero carbs for my daughter who has diabetes type 1. My dream has been all my life to eat Meringue and Pavlova without sugar because this is actually only eggs, which is a perfect fitness food. I always wondered if it was possible to take out sugar from Besee biscuits so I could eat them as breakfast, lunch, and dinner. It was always a dream for me. And this year my dream finally became true! This is my first Pavlova without sugar and it's very tasty! No added sugar, real and delicious fitness food! Yes, of course, it has a slightly different taste, but it is worth it! My first Pavlova with Golden Stevia! My dream came true after 20 years dreaming! No Sugar added real delicious fitness food! I have tasted hundreds, different sweeteners along the years. They are usually called Stevia sweetener and they come in white or green packages. In Europa, you can find them in shops, pharmacies, etc. I never really saw Stevia consistent for more than 3%. Typically it is only 0.02 % Stevia and all the rest filled with erythritol, xylitol, aspartame, inulin, sucralose etc. and they all taste bad giving you a bitter aftertaste. You can't use them for real! Luckily I found Golden Stevia in the Philippines. I found my dream, our family lifesaver, and happiness in a Philippines organic farm. First time I tasted Golden Stevia, it was a delicious sweet taste! Love at first sight! Golden Stevia is taken from a Stevia plant and is a 100% natural product. And it has it all, has Zero Calories, Zero Carbs, Zero fat, Safe for Diabetics, and zero glycemic indexes. I founded my dream, our family lifesaver and happiness at Philippines organic farm. Love from first sight! Golden Stevia is from a Stevia plant 100% natural product. Golden Stevia is very sweet! My daughter name is Arabel and she has diabetes type 1. It was discovered 7 years ago when she was only 5 years old. This was a life-changing moment. Your whole life suddenly changed forever and you just ask yourself "why me?" 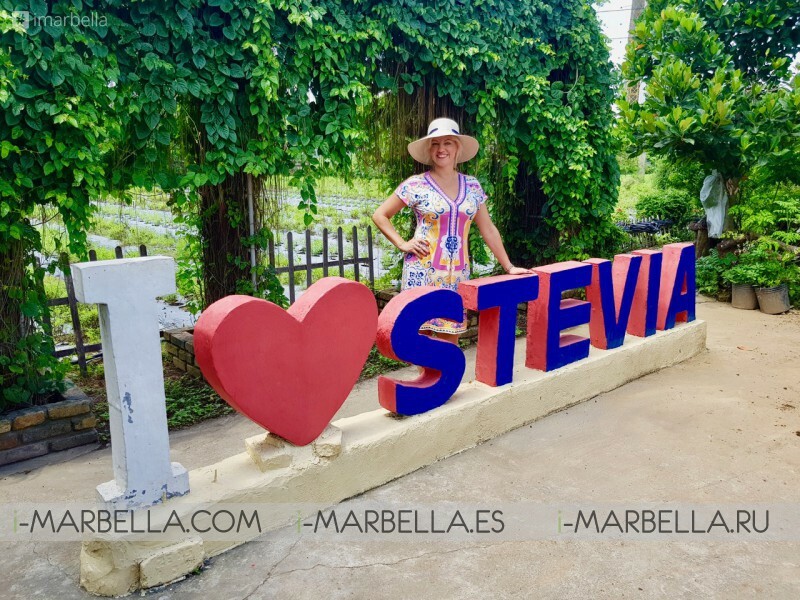 Arabel can eat every homemade food and desserts that I prepare at home with Golden Stevia without any stress. Too many carbohydrates and sugar will raise her blood levels too quickly and too high. Luckily for us, Golden Stevia doesn't raise blood sugar, it has a Zero Glycemic Index. She can also eat Golden Stevia premium quality badged products that she desires. Of course, she has to measure blood sugar every time before eating and add insulin according to other carbohydrates in food, but this is much less of a burden. 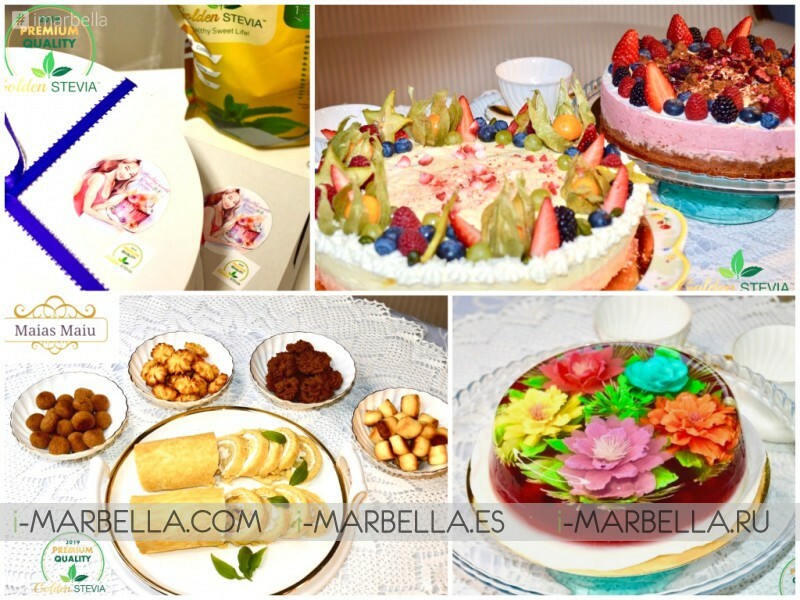 I prepare at home all desserts, pancakes, jam, cakes, biscuits, smoothies, muesli, yogurt, kisel, jelly, porridge, ice-tea etc. with Golden Stevia. This lower tremendously the number of calories and carbohydrates. Look at this breakfast picture for example. A bowl of muesli with yogurt, a coffee, so you have started the morning with 51.1 g of sugar! An amount of sugar allowed per day is 30 g and you can get it only from natural food. 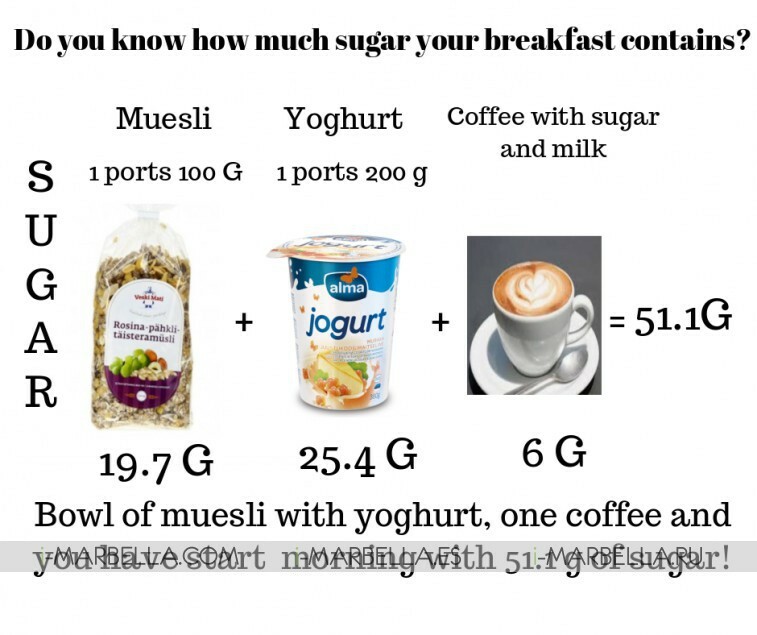 A bowl of muesli with yoghurt, one coffee and you have start morning with 51.1 g of sugar! Now we can also buy Golden Stevia premium quality badged products where are not added sugar. You can find Golden Stevia quality food, desserts, cakes, chocolate, candies, juices, smoothies, jams, ice-cream made with Golden Stevia and where is no added sugar. Sugar can only appear if the natural producer contains natural sugar. For example, fruits, milk, etc. Golden Stevia gives out recognition badges, certificates, and awards to different businesses and people who use Golden Stevia instead of white sugar in their products. Golden Stevia recognition gives customer confidence that this institution uses only premium quality sweetener in their food. Golden Stevia recognition program! 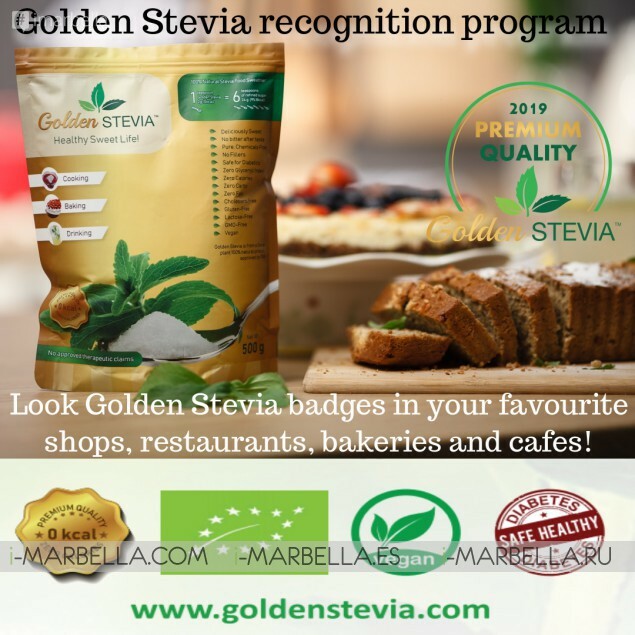 Look Golden Stevia badges in your favourite shops, restaurants, bakeries and cafes! Check our Golden Stevia badges in your favorite site shops, products, restaurants, bakeries, and cafes.